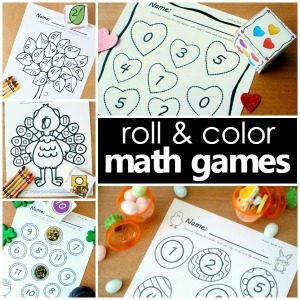 Now that school has started we’re ready to welcome fall, and we always love to kick off fall with apple theme activities. 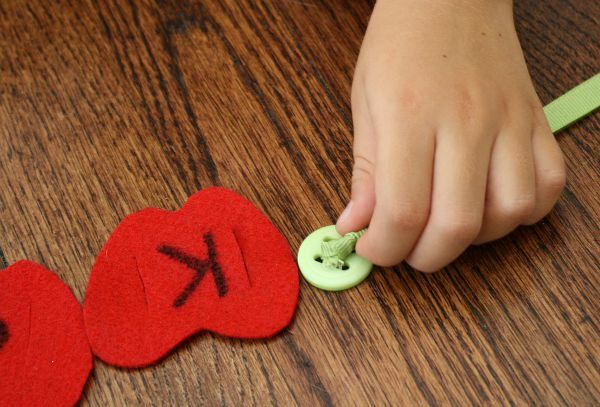 This button worm lacing name activity is a hands-on way to help kids recognize the letters in their name and practice fine motor skills. We’ve had a traditional button snake inspired by Happy Hooligans for years. It’s a great beginner toy for threading and fine motor practice. Now that Tinker is able to thread that with ease I thought we’d try another variation to help her practice the movement for weaving and sewing activities. Two green buttons-bonus if you can find ones with holes like these! I was lucky to find these buttons in a set of green buttons I have from Walmart. The ribbon fit through them perfectly, so I did not need to do any sewing. I simple laced one end of the ribbon through the button holes, knotted it, and trimmed off the excess ribbon. If you fear the ribbon will fray, use Fray Check to seal it. Repeat this process for the other end of the ribbon. Cut apples out of red felt. You’ll need as many apples as there are letters in your child name. 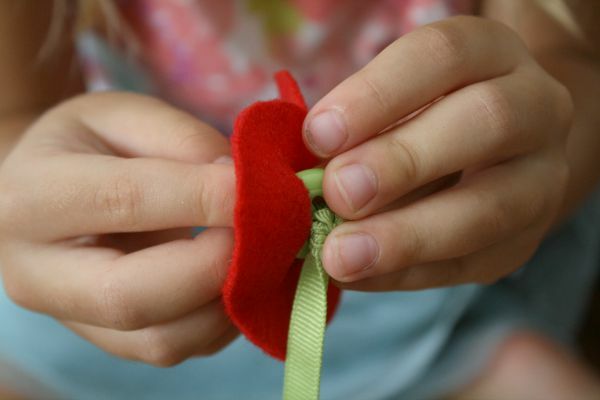 If your child is a toddler or just beginning threading activities you may want to try a single hole in your apples and use this as a more traditional button snake activity like this button worm fine motor activity from Stir the Wonder. However, if your child is ready for a little more, then label the apples with individual letters and cut small slits (large enough for the button to fit through) on both sides of the letter. To get kids excited about the activity it’s fun to play up the “worm eating all the apples” concept. 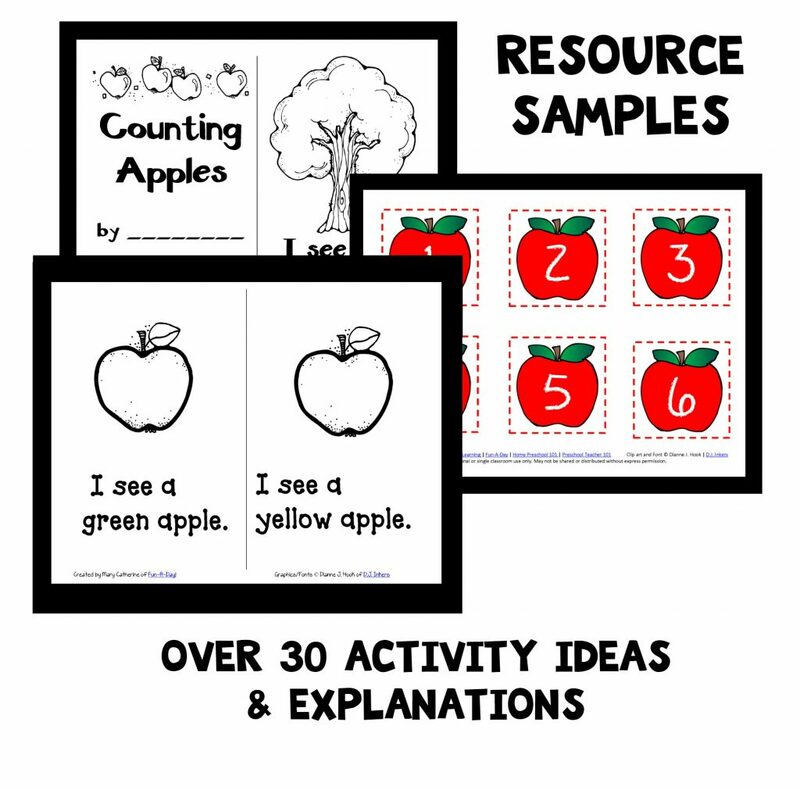 We love singing the song “5 Little Apples” where the worm eats all the apples from the tree, so Tinker and I sing this song before she does this activity. Then she likes to have her “worm” sneak up to the apples before gobbling them up. You’ll need to model for your child how the worm likes to go in the first hole (sneaking in the apple to munch on it) and then come out the second hole. It may be tricky at first so practice together a few times. Remember this is a more challenging variation of threading activities. 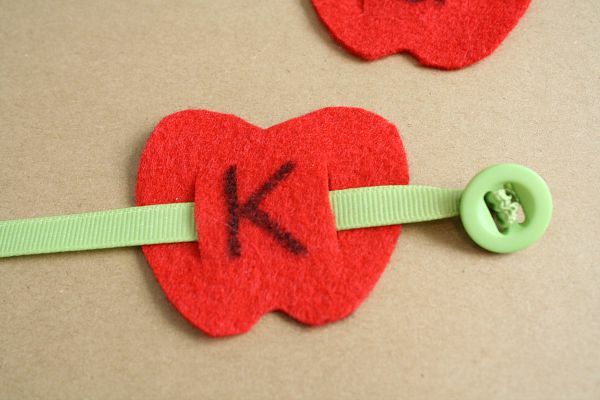 As your child’s weaves the worm in and out of each apple the letters will show above the ribbon. And once the worm has eaten all of the apples in your child’s name he or she will be able to read all of the letters laced on the ribbon. 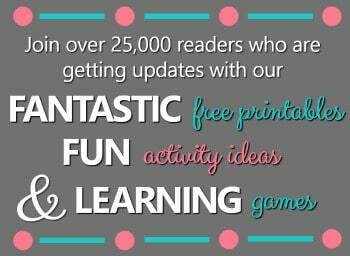 For more fine motor name recognition fun try our ping pong push name game.